A number of studies have been conducted with the objective of correlating productivity loss with changes in temperature. The chart below shows a composite chart plotting the results of these studies. NASA found and reported in a heat stress report CR-1205 (1) that temperatures over 80 F have a marked NEGATIVE effect on both the productivity and accuracy of work. This study and its results are still the authoritative reference used as the foundation for NASA standards and design. The following table is a summary of the relationships identified during NASA tests between temperature, work output and accuracy. OSHA regulations dictate a work/rest regiment as shown in the table below as work area temperatures reach certain levels. These TLV's are based on the assumption that nearly all acclimatized, fully clothed workers with adequate water and salt intake should be able to function effectively under the given working conditions without exceeding a deep body temperature of 38�C (100.4� F). They are also based on the assumption that the WBGT of the resting place is the same or very close to that of the workplace. Where the WBGT of the work area is different from that of the rest area, a time-weighted average should be used (consult the ACGIH 1992-1993 Threshold Limit Values for Chemical Substances and Physical Agents and Biological Exposure Indices (1992). These TLV's apply to physically fit and acclimatized individuals wearing light summer clothing. If heavier clothing that impedes sweat or has a higher insulation value is required, the permissible heat exposure TLV's in Table III: 4-2 must be reduced by the corrections shown in Table III: 4-3. AZEVAP performed a regression analysis using the productivity studies data to arrive at a single relationship taking each of these studies into account that would allow calculation of facility productivity loss costs as an input to business case analysis of alternative cooling systems. 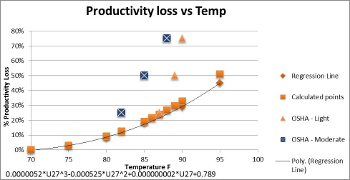 The OSHA rules applicable to work area temperatures and productivity are shown separately in this plot. The resulting curve is shown in the figure below. 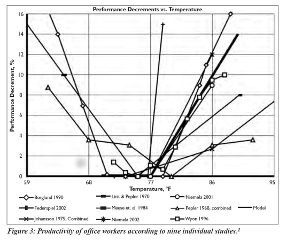 The application of this productivity loss vs temperature relationship to the temperature profiles for typical recirculating cooler installation and integrated displacement cooling result in identification of a significant number of lost productivity hours (with associated costs) for the typical recirculating cooler installation.